Travel bug screaming your name? Track your travels, scratching your way across the globe uncovering Hidden World Wonders. Click ADD TO CART now & let your travel memories live forever. WHO IS THIS MAP FOR? HOW DOES THE SCRATCHING WORK? Just like those scratch off lottery tickets you buy at gas stations. Use a coin to scratch off the black & white layer, revealing bright neon colors. Color means you've been there, black & white is yet to explore! Yes, both the World & US versions have each US state outlined for maximum accuracy. Whether your journey is global or domestic you can knock off the states one by one. asked. Click Add to Cart now & let your travel memories live forever. US STATE BORDERS... on both the World and US versions of the map. Scratch off each outlined state separately on your journey to visit them all! 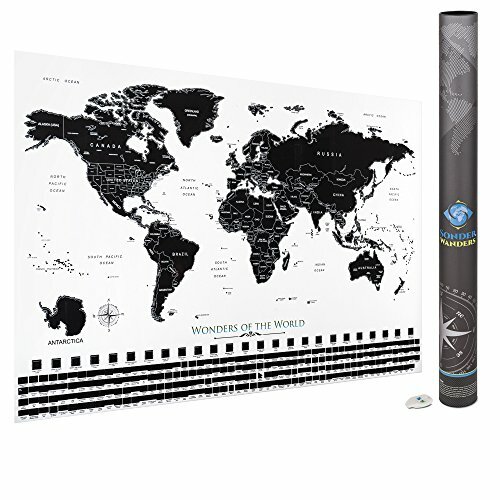 RELIVE MEMORIES... of your best travel moments every time you walk by the Map. A quick smile can put you in a state of gratitude, especially during a rough day. REAL LOCATION ACCURACY... Detailed cartography tells your travel story exactly the way it happened. Our maps are genuine to scale & cartographically accurate. If you have any questions about this product by Sonder Wanders, contact us by completing and submitting the form below. If you are looking for a specif part number, please include it with your message.